Patti Smith, writer, performer, and visual artist, appears with her daughter, pianist Jesse Paris Smith, for a special evening of poetry and music inspired by the works of Emily Dickinson. * The exhibitions I'm Nobody? Who are you? The Life and Poetry of Emily Dickinson and Delirium: The Art of the Symbolist Book will be open at 6:30 pm for program attendees. Jesse Paris Smith and Patti Smith. Photography by Steven Sebring. 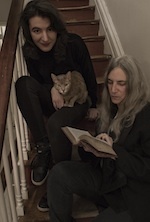 Audio Caption: Patti Smith, Jesse Paris Smith, and Rebecca Foon performing Emily Dickinson's poem "Nature" Is What We See. Pathway to Paris, Live at Le Trianon.